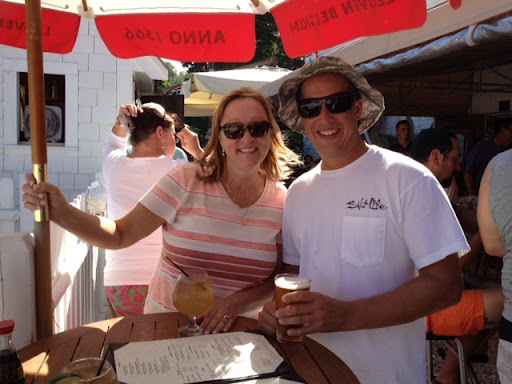 Eataly, NYC & Cape Cod Family Fest…. Oh these weeks have caught up with me and I’m very behind in posting! My mom came into NYC to visit one afternoon. 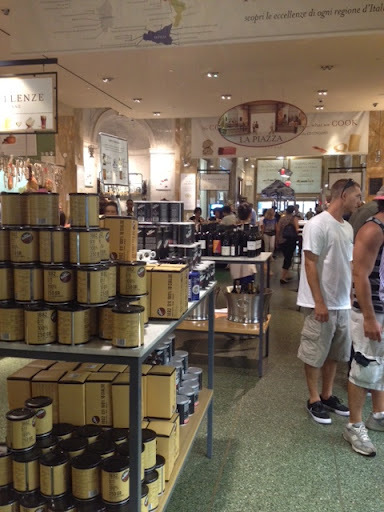 Just like me, she is a big foodie, so I thought it would be perfect to take her to Mario Batali’s famous Eataly. For those unaware of this Italian mecca – picture an Italian market on steroids – a whole block long, filled with anything & everything italian. Specialty foods, 5 restaurants right inside the market (one being vegetarian! 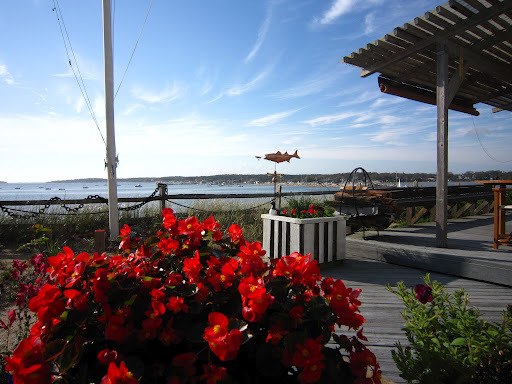 ), cooking classes, wine and cheese tastings, bakery, you name it, they’ve got it. It’s a very overwhelming place. The first two times I visited I ran out empty handed with my head spinning. This time was different though. My mom and I sat down and enjoyed a lovely meal in the upscale restaurant Manzo then slowly made our way through the market checking everything out. 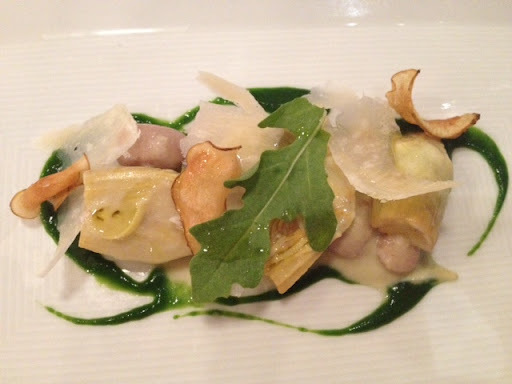 For an appetizer I got baby artichokes with cranberry beans, arugula, & sunchoke chips. 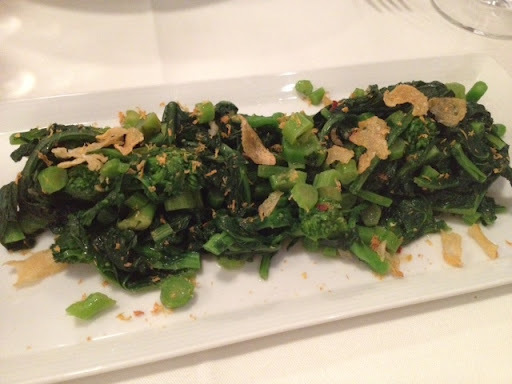 As a side, we shared broccoli rabe…mmm…it was done perfectly and topped with frizzled garlic chips. 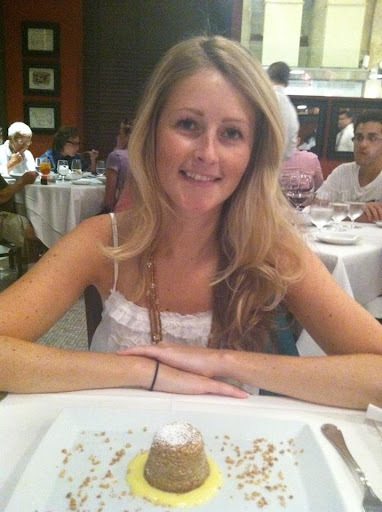 For dessert we shared this cute little hazelnut torte. It wasn’t gluten free but I’m ok to treat myself here and there. It wasn’t too sweet either which I love! 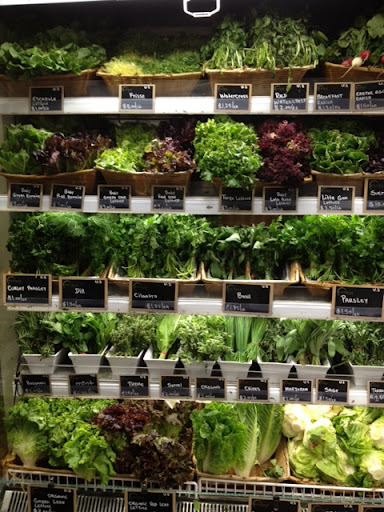 Their produce section was beautiful. 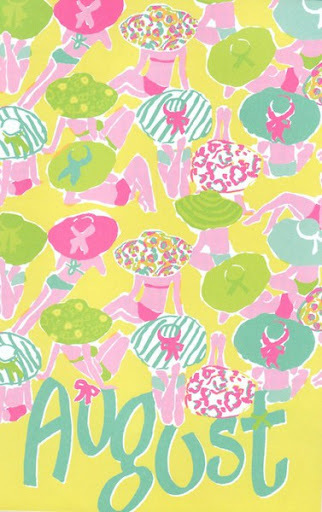 Everything was so bright and perfect. 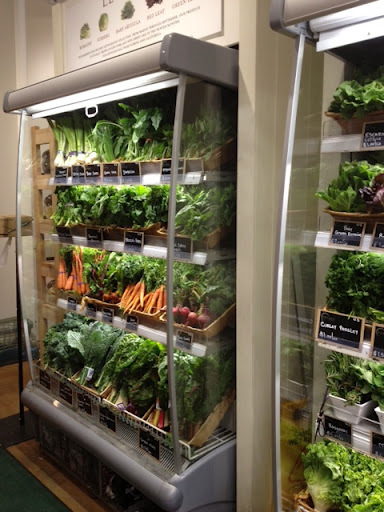 Although not everything was organic they had a pretty big selection of organics mixed in. I was pretty impressed. I wanted to take pictures of everything! I refrained myself though. 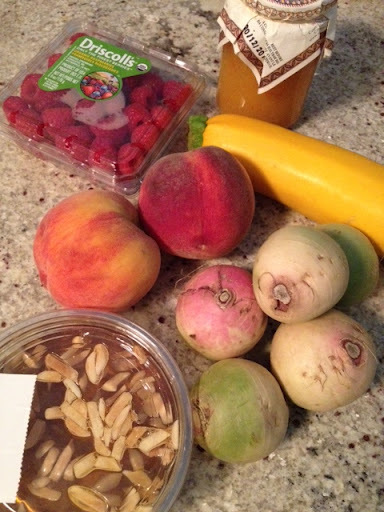 From our little adventure, these were my souvenirs….an amazing almond amaretto honey, mandarin orange marmalade, watermelon radishes, organic peaches, organic raspberries, and a bright yellow squash. 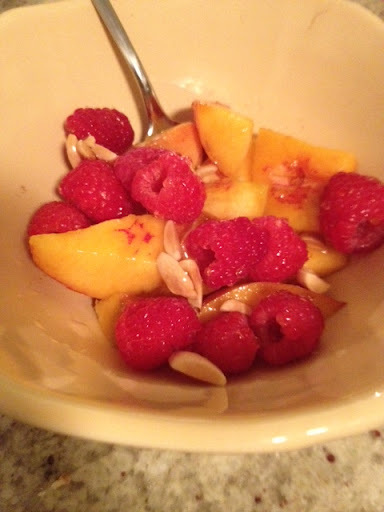 This honey drizzled over fruit is AMAZING. 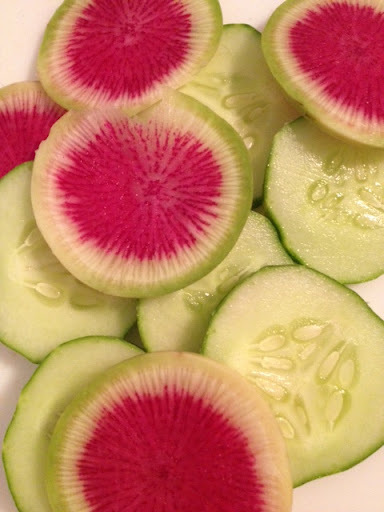 Oh, and check out this watermelon radish!!! How beautiful right? Nestled underneath is a fresh picked cucumber from my garden. First one in fact that I’ve ever grown. Can I tell you, that it was seriously the best cucumber I’ve ever had! I don’t know if it’s the taste of satisfaction from growing your own, or if its because I organically grew it with love, but man oh man. 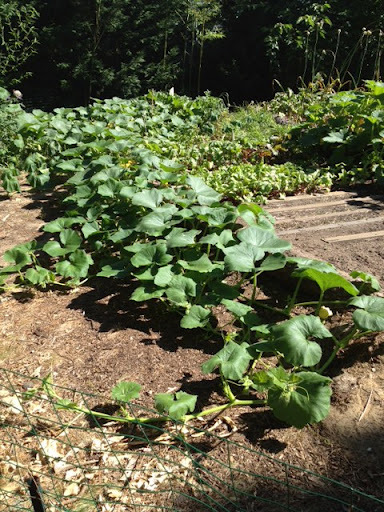 I have been stalking the cucumbers that are growing now like a little maniac. I can’t wait to pick another! All of my Dad’s side spends a weekend at my Grandparents. 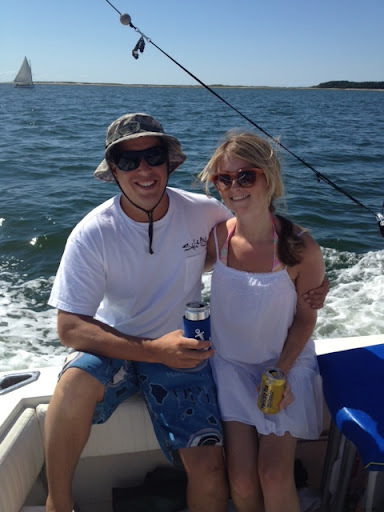 There is fishing, boating, cookouts, beach time, and lots of good memories created. This year I made official tee shirts for everyone. Don’t we look like a big soccer team? Everyone made something to bering up, so I decided to make a big organic salad. I wanted it to be really colorful so I diced red and yellow peppers, yellow carrots, zucchini, cucumbers, green onions, heirloom tomatoes and watermelon radish over romaine. 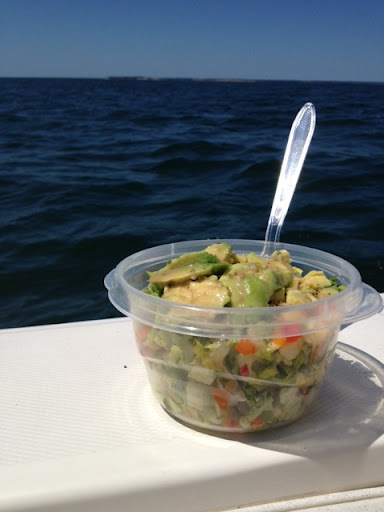 I don’t have a picture of the end result, but this was a little leftover that I brought on the boat topped with avocado. Unconventional snack to bring on the water, but it worked! There are really no options for Vegans in Cape Cod so I try to pack as much I can of my own. 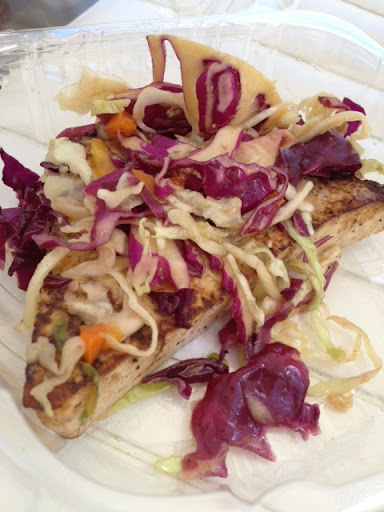 I was pretty excited to find this Asian Pan Glazed Tofu Steak with cabbage slaw at the center market in town. It was delicious! My honey and I decided to rent our own place. Our grandparent’s cottage gets really crowded and we wanted our own space (and I wanted my own bathroom!) I found the greatest little cottage! It was a wing off of the hosts house with a private entrance/private driveway. It was in the woods so it was very quiet, so peaceful & only a 2 minute drive to my family’s place. 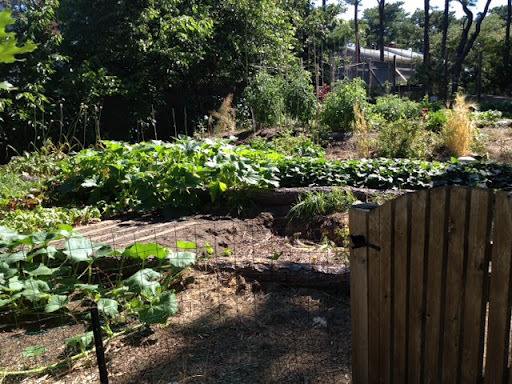 This was their vegetable garden on the side of the house! The best part? 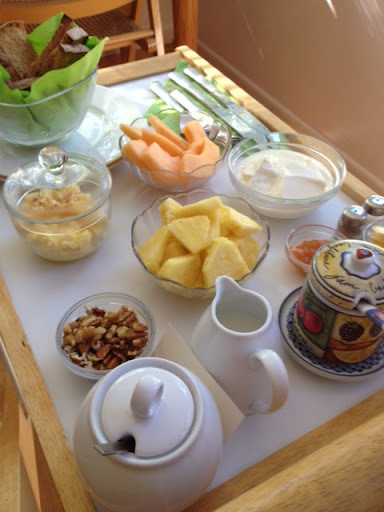 They wheeled in a tea cart each morning with homemade organic breakfast. They do not serve meat, but they did ask if we had any dietary restrictions. In these types of instances I will eat out of my strict dietary regimen because I didn’t want them to have to go out of their way to make two separate breakfasts for my honey and I. They were already making him a separate egg dish so I wanted to be happy with whatever they served me. Most importantly, in moderation, these foods do not bother me so I just considered this a treat. 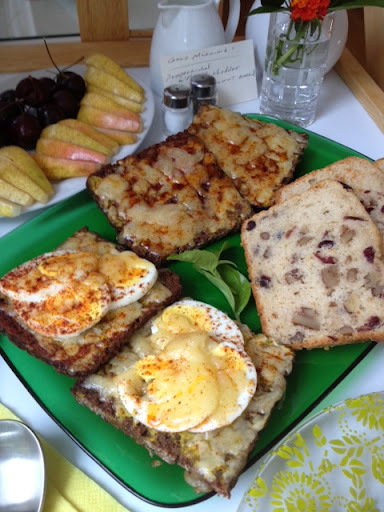 Day one: I ate homemade cranberry walnut bread with fresh jam, 100% rye with vermont cheddar and fresh fruit. 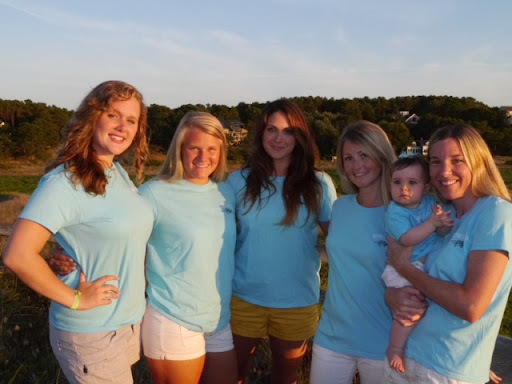 I will leave you with a few pics from my family weekend. My mom & my honey. Lastly, the most beautiful sunset I’ve seen. 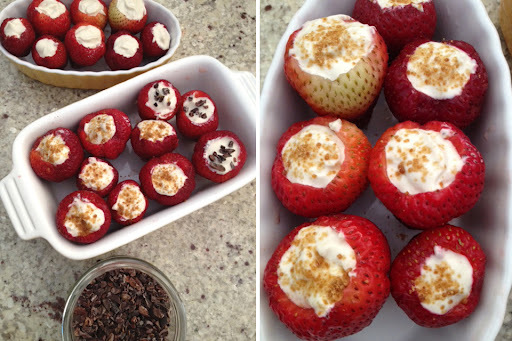 Next post will be filled with my latest yummy recipes! If you’ve ever read behind a bottle of lotion, chances are you’ve noticed a long list of chemicals that you may not be familiar with. And many of these chemicals and synthetic products have harmful effects after years of use. I have never been too concerned with what beauty products I was using until I switched my diet to a plant based one and dedicated my lifestyle to being more GREEN. You may not realize, but what you put on your skin is just about the equivalent of eating it. Skin is the largest organ of the body and absorbs whatever you put onto it; therefore, it is vital to keep the ingredients that we use non-toxic. If you are concerned with what foods you put in your mouth, why not start becoming aware of every ingredient you place on your body? 1- Parabens can cause cancer. Studies suggest that the same ingredients that are used as preservatives in many cosmetics and personal products have been linked to certain cancers. While the debate goes on about parabens, it would probably be best to buy vegan skin care products or organic skincare products, just to avoid all products with parabens and other harmful chemicals including phthalates (which can lead of various health problems due to its toxicity) and synthetic colors/fragrances (again due to carcinogen links). Parabens are suspected to be endocrine disruptors, and they have been found to mimic estrogen in laboratory experiments. Many people have allergic reactions to these preservatives causing skin rashes and irritation. Needless to say, there is a great ongoing debate as to the safety of products containing parabens. 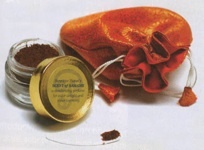 It takes a lot of diligence to become aware of whats in your makeup and beauty products. REading labels more extensively and being aware what hidden ingredients mean. For example “carmine” is a colorant that is literally made from crushed bugs. Lanolin is a common ingredient in cosmetics, and is usually animal-derived. 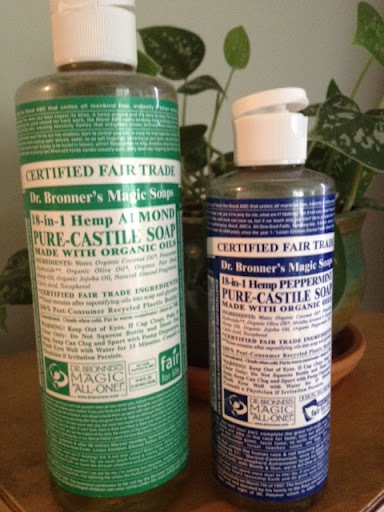 2- Many “natural” products are not really that natural. 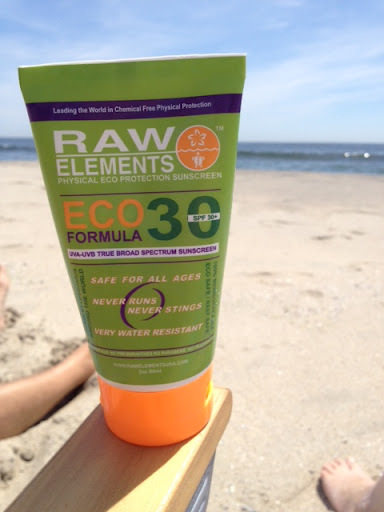 If you are buying a lotion, sunscreen, or soap because it says the word natural on the packaging, beware! 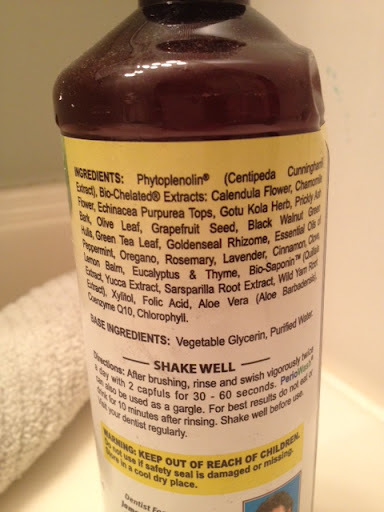 Read carefully the back of the product and check the ingredient list, it may indeed have a few naturally derived chemicals or essential oils, but it may also have synthetic chemical agents too. If you don’t want to make your own handmade vegan skin care products, check out The Campaign for Safe Cosmetics which lists organic skincare products that are safe. 3- Since most conventional products include preservatives and synthetics that deposit toxins in the bloodstream, it is best to avoid them all together. Over time the accumulation of toxins can overload the body and its systems from years of intake. This smells incredible! Doesn’t lather up too much, but shampoo naturally should not lather. The chemicals that make them lather are detergents or surfactants. 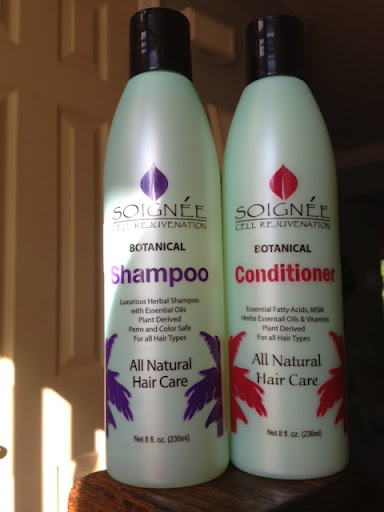 Most shampoos have a surfactant like sodium lauryl sulfate or ammonium lauryl sulfate. No more bar soap for this household! While there are a number of chemical concerns, there are three synthetic components in commercial soaps you need to be most concerned with: 1) Triclosan; 2) Sodium Lauryl Sulfate (SLS); and 3) Fragrance. Finally, triclosan has now been found in 3 out of 5 women’s breast milk. It is also one of the most detected compounds in rivers, streams and other bodies of water, often in high concentrations, and is highly toxic to a number of different types of algae. This could have very destructive effects on aquatic ecosystems. One of the most dangerous chemicals being added to virtually every personal care product you can imagine, including soap, shampoo, conditioner, and cosmetics, is Sodium Lauryl Sulfate (SLS). SLS is an anionic surfactant and the most commonly used chemical in car soaps, garage floor cleaners, engine degreasers and personal care products. 95% of the chemicals used in fragrances are petroleum-based synthetic compounds.Most of these chemicals are not tested for safety. Manufacturers are only required to print “fragrance” on the label, nothing more. Additionally, a product labeled “unscented” may contain a masking fragrance. A product must be marked “without perfume” to indicate no fragrance has been added. I know some may find this odd but I don’t wear deodorant. I rarely sweat and if I do, it doesn’t smell. I guess you can say I’m lucky but maybe this means I’m not working out hard enough…hmmm. Recently I’ve been trying to find a brand for my boyfriend to replace the chemical filled brand he currently uses. He tried the Pure Pitz below and said it felt like jelly sitting in his underarm. Yuk. 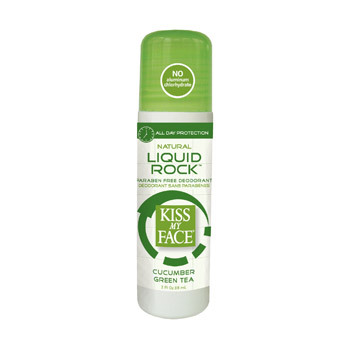 I want to try Kiss My Face brand next on him– it got good reviews in my research. The Scent of Samadhi on the bottom is very fascinating to me and although I don’t necessarily need it, I’m going to try this out. It sounds like it will smell yummy. 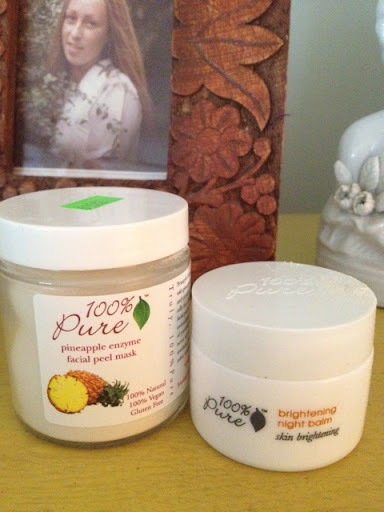 I absolutely love ALL 100% Pure products!!! I start with using the brightening toner (which I swear has lightened my badly freckled face). 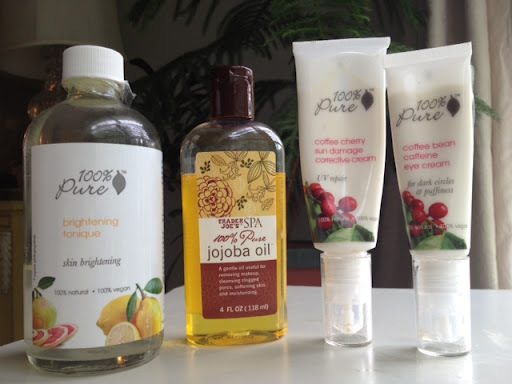 Then I mix a little Jojoba oil from Trader Joes with Coffee Cherry Sun Damage Cream to use on my face and neck. The Coffee Bean Caffeine Eye Cream is something I use twice a day and let me tell you, this stuff is amazing! I used to have very bad dark circles and this has helped diminish those incredibly. All of 100% Pure products smell SO GOOD too. At night I sometimes use the brightening night balm. It gets my skin GLOWING. Once a week I also use the pineapple enzyme facial peel mask. It comes as a powder and all you have to do is mix a little water with it and leave on face for 10 minutes. 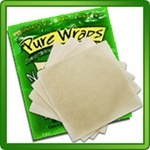 It does a great job with renewing your skin’s surface. 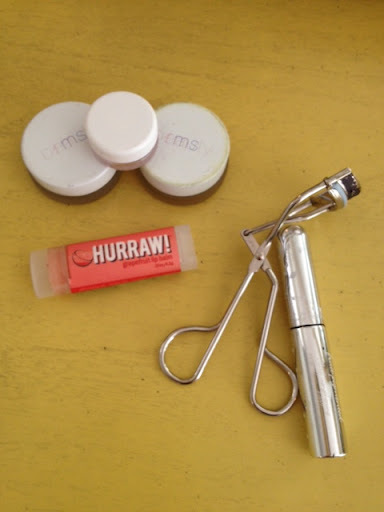 Hurraw Raw Lip Balms are amazing!!! I have many flavors and keep one everywhere with me. A line I discovered that is vegan and all natural is RMS Beauty. From the right, Living Illumination-when you want that extra little glow on your cheekbones. I love this stuff! In the middle is the Simply Cocoa Lip and Skin Balm. 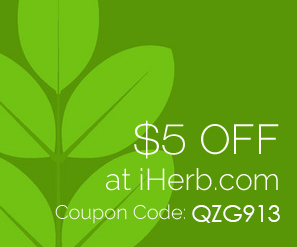 This makes your lips extremely soft and also helps any irritated or chapped skin. 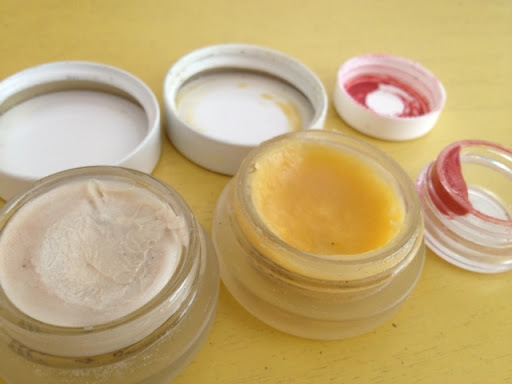 To the right is a sample of their cheek and lip tint. 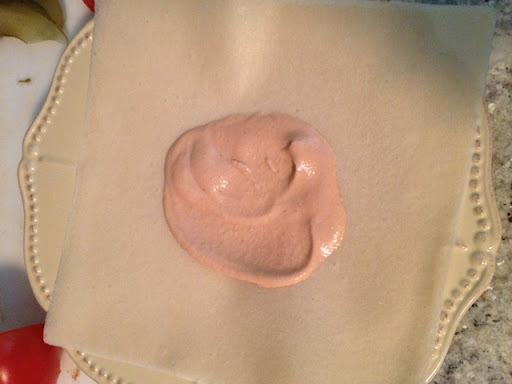 This looks amazing both used as blush and lipstick! The rest of my makeup products are from 100% Pure. 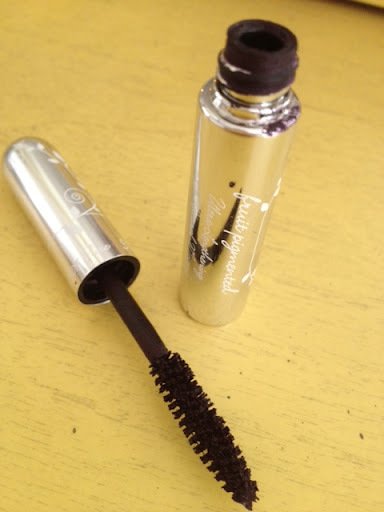 LOVE LOVE their Blackberry Mascara. This stuff even smells good! I used to be a real mascara snob, only buying my beloved brand from Macy’s which was super expensive. Low and behold this stuff, that is all natural and won’t damage my eye area like the other brands is BETTER! Who knew! This little tube has been lasting me for months too which is another plus. I have always had teeth issues. Every time I go to the dentist I have a cavity, I’ve had a few painful root canals and I always had extremely sensitive teeth. 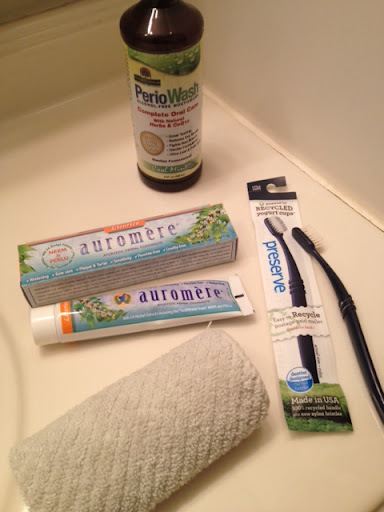 I took care of my teeth too so I wasn’t sure if it had something to do with the Crohn’s or the conventional flouride filled products I was using. 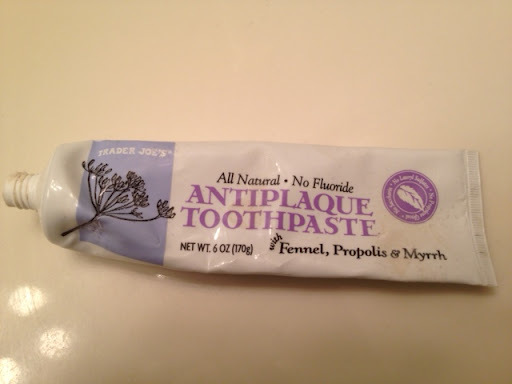 Since switching over to healthier toothpaste and mouthwash my teeth feel less sensitive and cleaner! Wish I did this earlier in life! 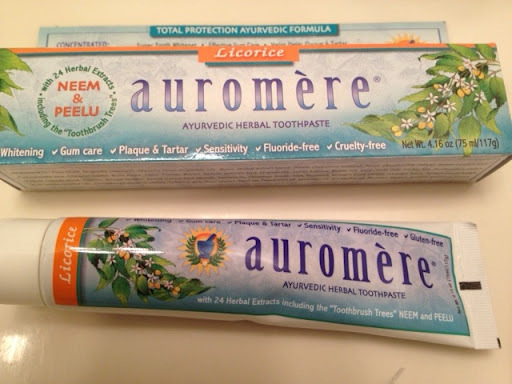 This brand Auromere can be purchased here. I highly recommend it. 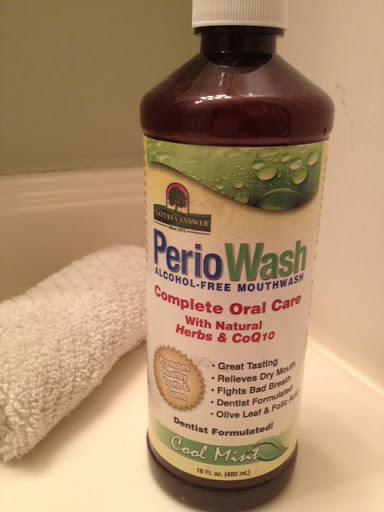 My new mouthwash is amazing! There are so many good things in this that are healthy for the gums and teeth. It also gives you that cool zing and fresh breath after using and tastes surprisingly good! This nifty toothbrush was found at Trader Joes. It is made from recycled yogurt containers. The best part is when you are done, it can be placed back into packaging you bought it in and shipped off at no cost to be recycled again! How cool? 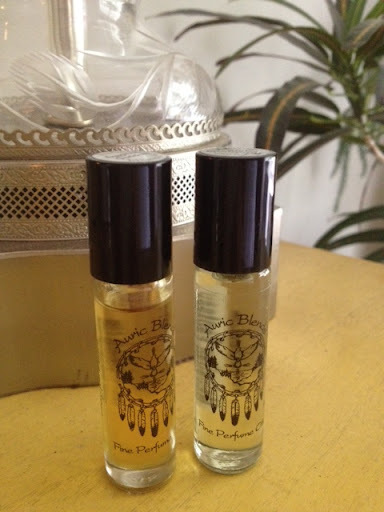 I’ve realized how even fragrances can be harmful to your health so I’ve somewhat ditched my old perfumes and have turned towards this amazing line of natural oils by Auric Blends. Don’t worry, they don’t smell all hippie-ish! My favorite so far is Egyptian Goddess. I also have Hawaiian Fantasy. They come in rollers and I just roll some on my neck and wrists. Its very subtle – which is perfect for me because I am very sensitive to perfumes. I don’t like anything to strong. 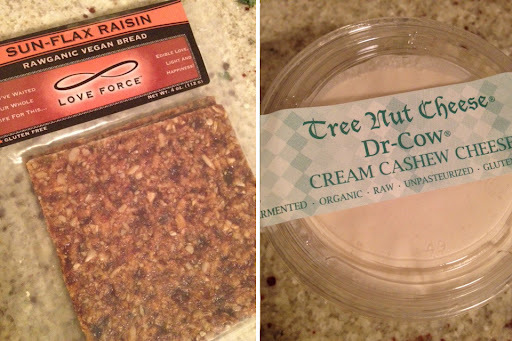 I found this being sold at rawfoodworld.com so I had to try. Although it does turn your skin slightly white , I love how smooth it goes on and is not oily at all. I love the ingredient list too 🙂 Check out their website here. I haven’t forgotten about my beauty routine post….that’s coming next. I promise. 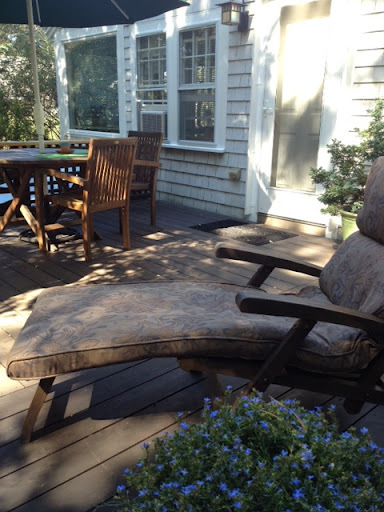 I wanted to premier a new product and feature it solely in this post. Yes, it was that good. Let’s talk veggie burgers. I’m sure you have tried many, yes? Some of them crumble in one bite, taste like cardboard, are filled with beans or fillers. Then there are the ones that are loaded with wheat, soy and a long list of unpronounceable ingredients with a high claim to be “healthy. I don’t know about you, but I like simple wholesome ingredients. Sunshine Burger makes a great veggie burger that is just that. To be honest though, I’m more in love with the ingredients rather then the taste. Yes, I know. 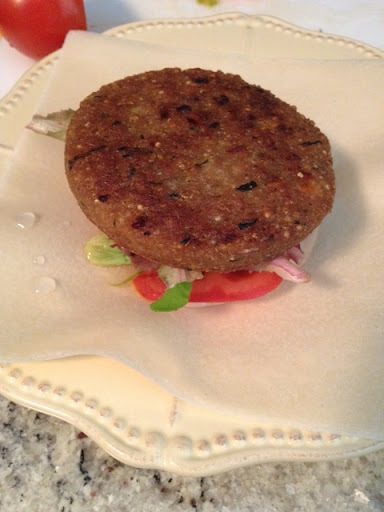 I still love you Sunshine burgers, but a new veggie burger just rolled into town and its going to be the star in my freezer for now on. The two pack burger package was staring me down. 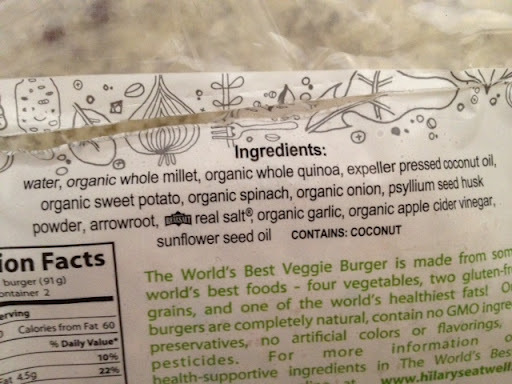 “The world’s best veggie burger”. Can it be? 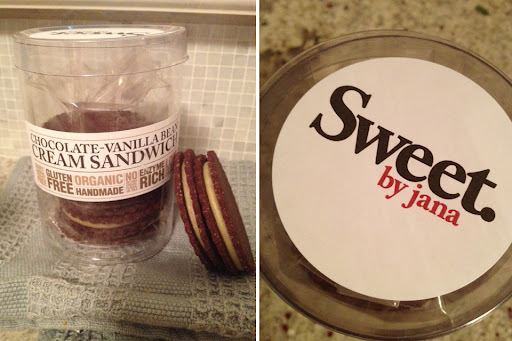 Ingredient list looks awesome (nice and short), price is right, love the simple packaging. Ok – in my cart you go. I’ve been seeing a trend around the blogs here with people claiming how good these burgers are so I was pretty excited to finally cook one of these babies up today. I didn’t make it just any ol’ way though. 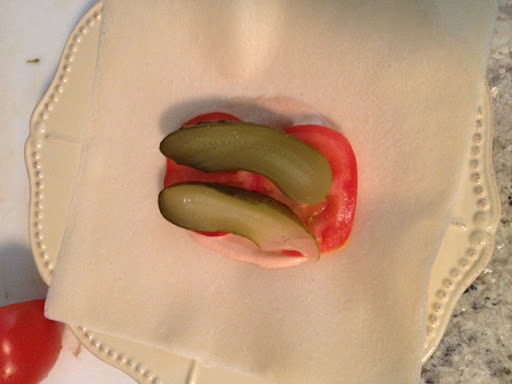 I wanted to make a super-duper veggie burger deluxe….pickles, special sauce, juicy tomatoes and all. 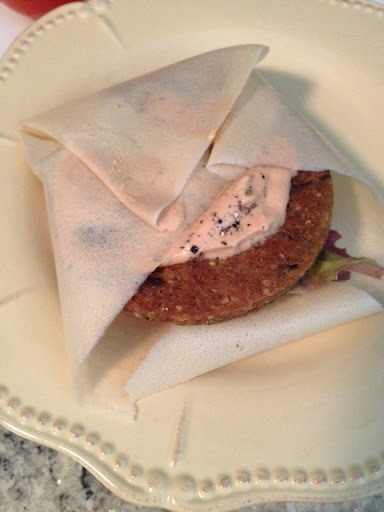 For the “bread” I didn’t go with the traditional gluten free bun or lettuce wrap – I went all out and used a raw coconut wrap. Yes my dears, this was one hell of a good burger, if I do say so myself. Take your raw coconut wrap and shmear some special sauce on there. This is what the raw coconut wraps look like all packaged up. 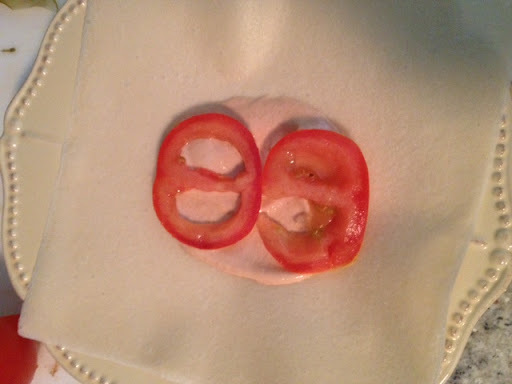 Next add some fresh organic tomato slices. Then some Bubbies raw pickles. 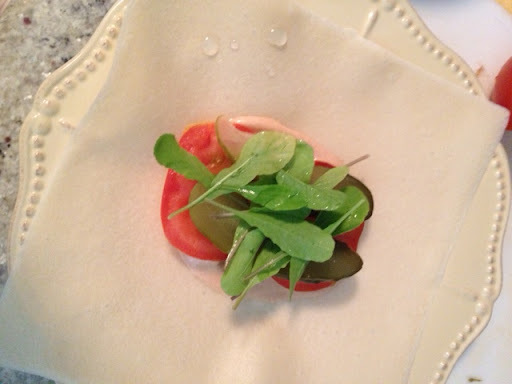 Then some greens…I used fresh picked baby arugula from my garden. and some fresh picked red leaf lettuce. 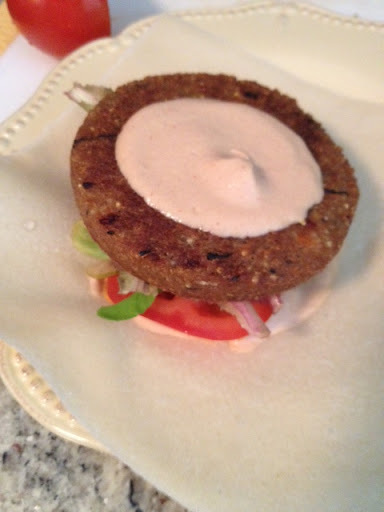 On goes the hot veggie burger. a little salt & pepper and fold it up like a little package. 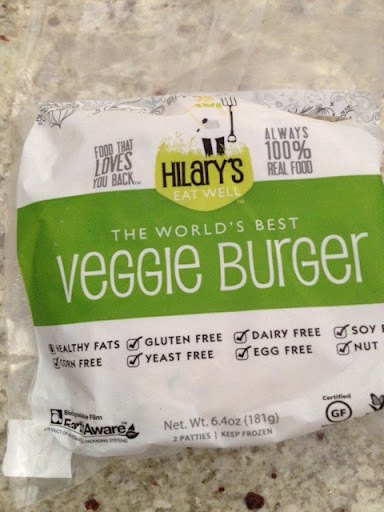 So the final feelings on Hillary’s Veggie Burger? I am a firm believer and supporter of the world’s best. 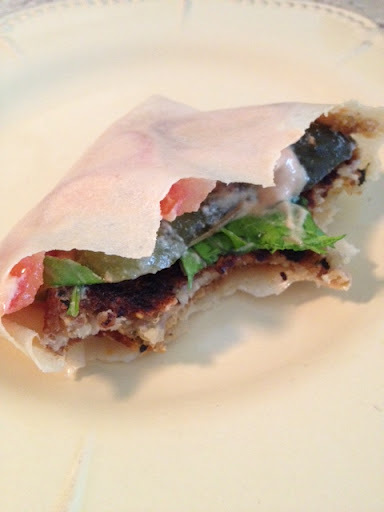 The texture was dense, held up in my thin raw coconut wrap and didn’t crumble once. The taste? Hearty, wholesome, a little nutty from the millet…and down right scrumptious. Am I talking up this burger too much? LOL. I promise I am not being endorsed – I just get so excited over new products that deliver what they claim. So get out and try one. They also come in Adzuki Bean flavor. This type of bean is very easy on the digestive track compared to any other bean!! I’m super behind in food posts so get ready for an array of awesome food that I’ve been eating these past few weeks! I’ve been really trying to eat more RAW because I just feel so much better when I do. Hard to stick to it 100% but I find it’s so much easier when I load up on RAW goodies and store-bought things, I tend to stick with it more. Another way that helps me stick with it, is preparing things in advance for a week at a time. 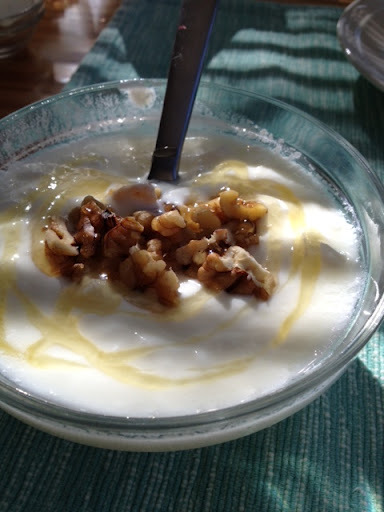 I tend to make batches of things on the weekends – for example, I will make a big container of raw coconut yogurt, 2 big jars of raw almond milk kefir, large containers of sun tea and lemonade, kale chips, crackers, cookies and freeze loads of bananas for smoothies. This helps my poor time management skills during the week tremendously. 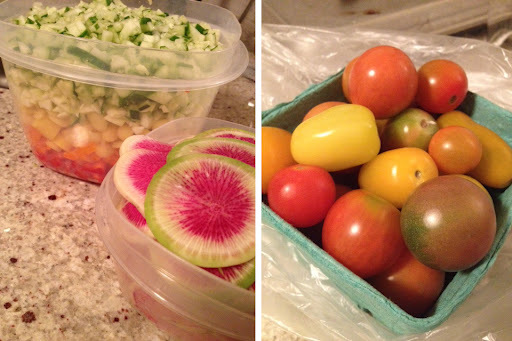 With that said, let’s talk good eats now…. I love simple fruit on it’s own but sometimes you just need to jazz things up with a sauce, dip, or sweet, or crunchy element. 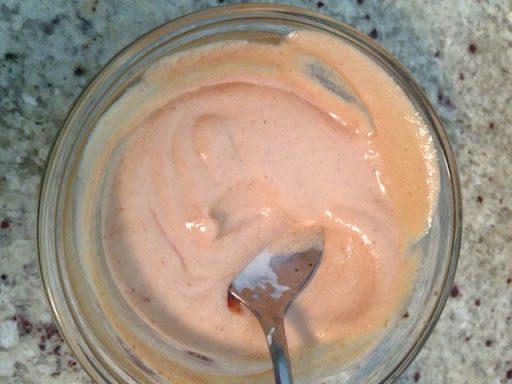 I made vanilla cashew date cream (recipe to come soon) and piped it into my hollowed out strawberries. Some I sprinkled with cinnamon and coconut palm sugar, and others I sprinkled with raw cacao nibs. Super healthy, super yummy, boyfriend approved….this cashew date cream is awesome to have in the fridge for dipping any type of fruit into it. 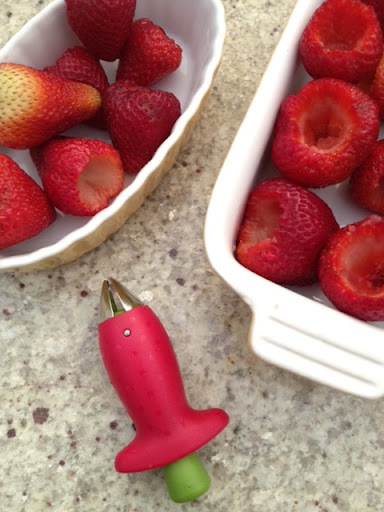 To hollow them out I used my nifty little strawberry huller tool. I bought mine from William-Sonoma HERE. 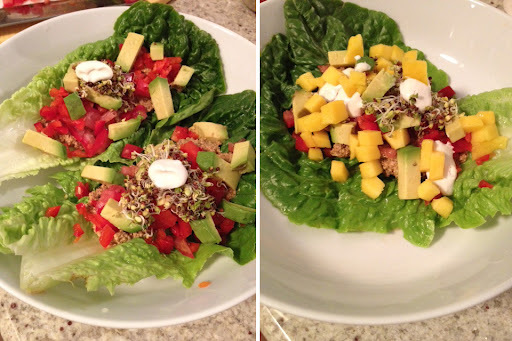 One weeknight I wanted something easy, raw and fast. Taco’s are such an easy thing to whip up. I soak walnuts for 20 minutes, drain, add a little taco seasoning and lime juice and a touch of water and process. 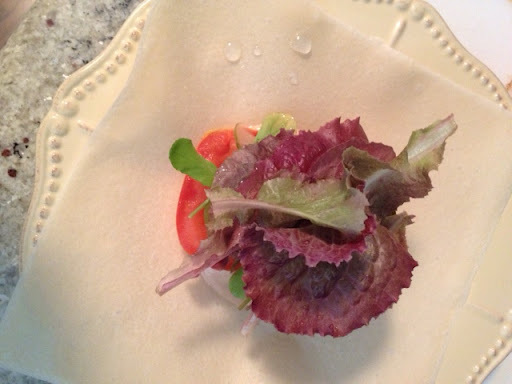 Then you can pile romaine leaves with toppings of choice. I added diced red peppers, tomatoes, avocado, broccoli sprouts and AtV Sour creme. Last minute I threw some fresh diced mango on top and this is what made it! All the flavors were amazing! I had some leftover components so I made this taco bowl for lunch the next day. Avocado and mango were meant to be together….mmmm. 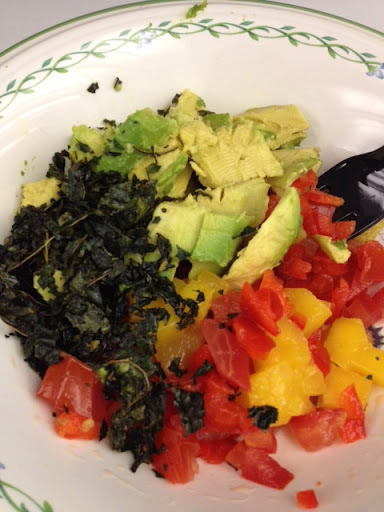 I also threw in some of my homemade kale chips on top for a little crunch. Speaking of kale chips, I can’t get enough of them! 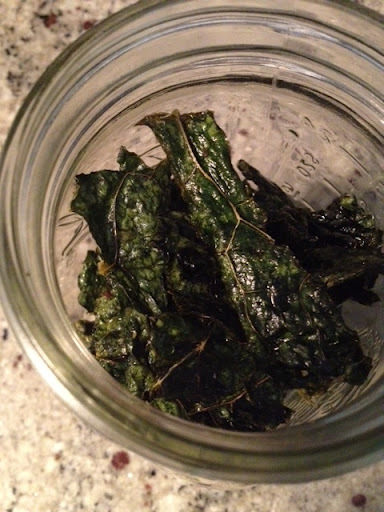 It’s a great way to get in your greens through a crunchy snack. I do not like store-bought chips one bit, but when I make them myself they seem crispier, fresher and they become an addictive snack. I can eat a whole batch in one sitting! On Sunday morning (when I typically crave pancakes) I was craving something savory. 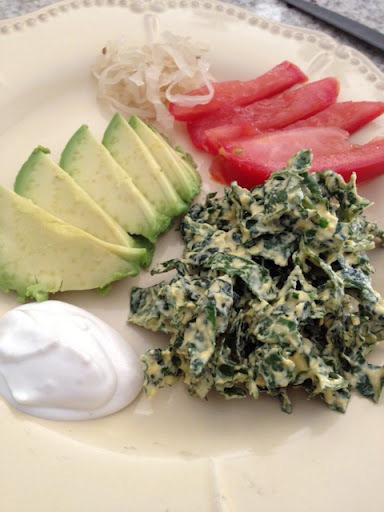 I had some cashew cheese sauce in the fridge, so I massaged some kale with it, sliced some avocado and tomato, a serving of kraut and a little AtV sour creme to balance it all out. Delish! 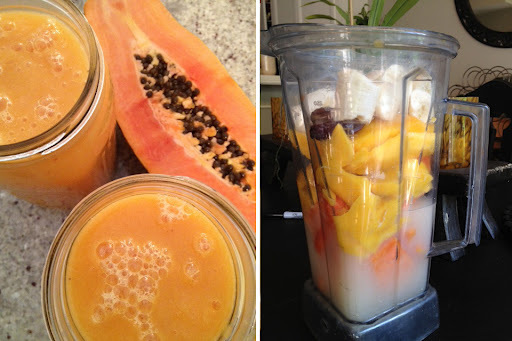 One morning I made the two of us a big papaya mango smoothie. Papaya is filled with enzymes that will help digestion as well as play a role in keeping inflammation at bay. It’s also filled with antioxidants and vitamins that support your immune system in many ways. The papaya made it very thick – I think next time I will only use a 1/4 of a papaya. 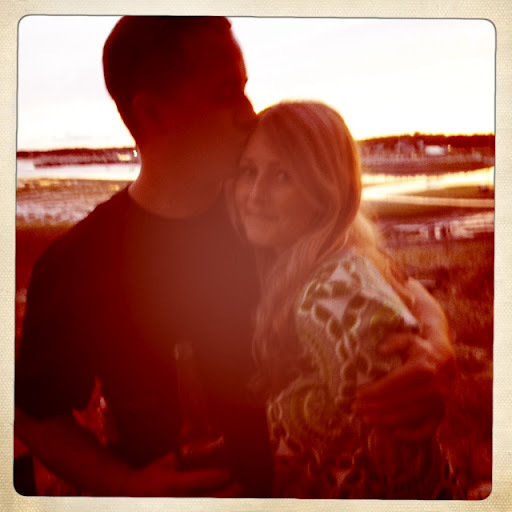 Over the weekend we took a little trip up to Cape Cod where my grandparents live. Boy, did I need a vacation! My commute has been wearing on me big time, so it was so nice to escape the Tri-state area rat-race and go to a place so peaceful, beautiful and quite. 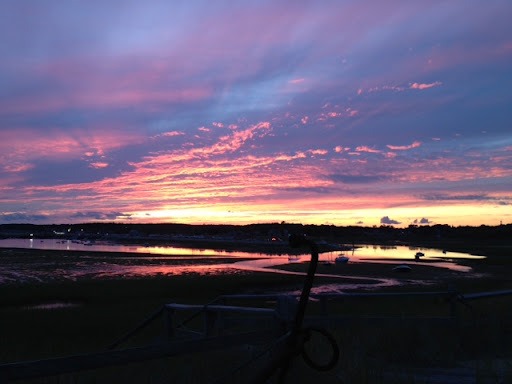 My grandparents live right on a bay and you could sit out on the deck for hours just watching the boats come in and out of the marina. All you hear are the laughs of the seagulls, ship bells clanking, flags flickering in the wind and motors of the passing boats. It is always so good for the mind to escape to this place that I call my second home. 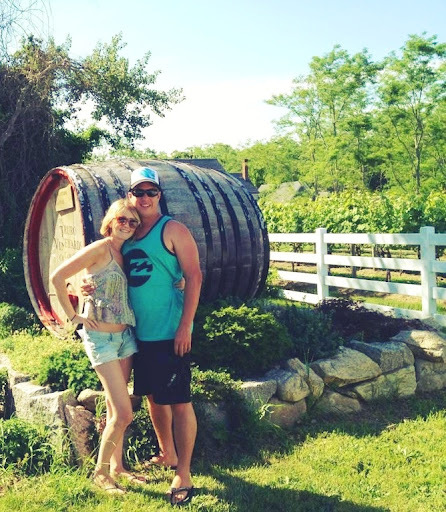 my honey and I visited the Truro Vineyard Winery. Wine is raw, right? 😉 It was my first time doing a wine tasting – so much fun! Love Force Sun Flax Raisin Bread was amazing! 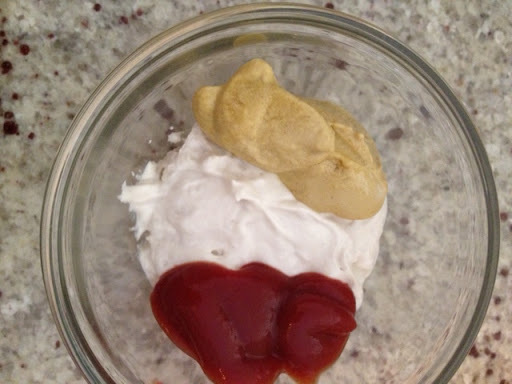 I ate this for breakfast smeared with cashew cream cheese by Dr. Cow. My local health food store carries this line called Awesome Foods. 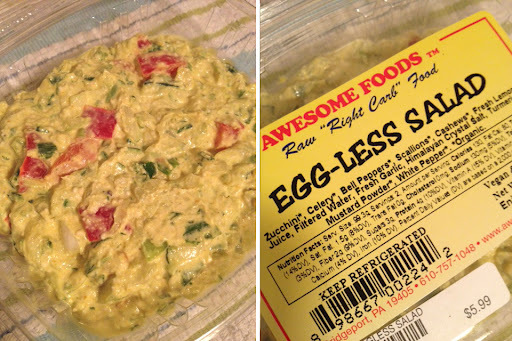 You also can order online HERE (they are out of PA) This Egg-less Salad was so delicious, especially on the crackers below. Talk about yum. 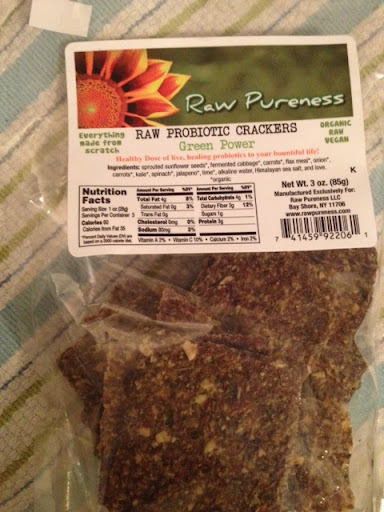 These Raw Probiotic Crackers by Raw Pureness were crispy and full of flavor. 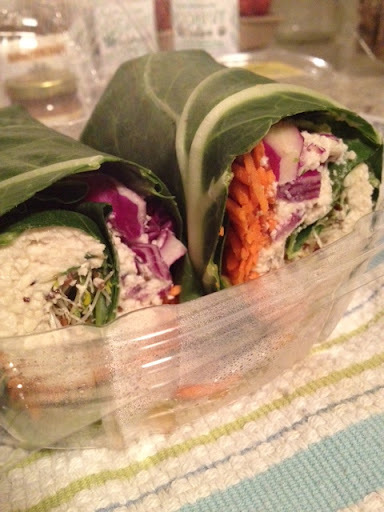 I absolutely love how they have fermented cabbage in them – yay for probiotic foods! I will definitely be stocking up on these. 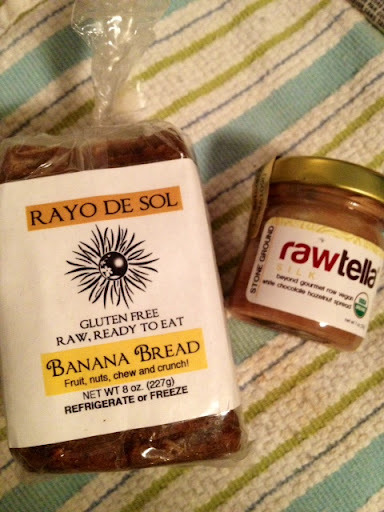 Rayo De Sol makes a line of mini raw breads that are unbelievably good. They are soft, chewy and filled with flavor. 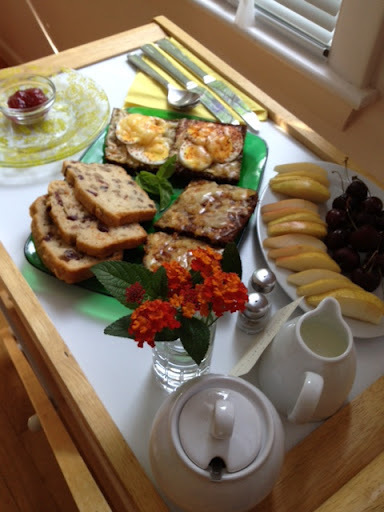 I love the banana bread with Silk Rawtella on top. 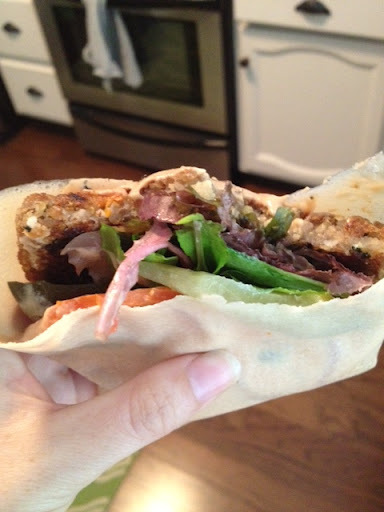 I also picked up a raw collard wrap that had veggies and cashew cheese inside. Wasn’t my favorite but it did the job for lunch one day. 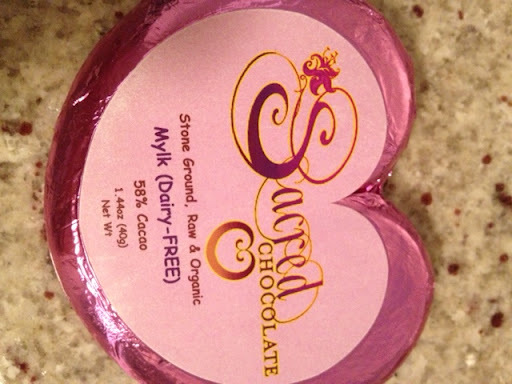 I’ve been purchasing a new a flavor of Sacred Chocolates each week – this is the Mylk flavor. 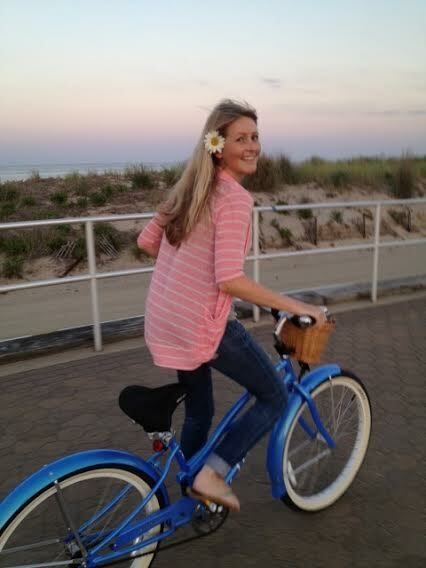 Last but not least….I know this isn’t raw, but a girl sometimes just needs some pizza. I’ve sampled my fair share GF frozen pizza’s! As you probably know, its tough finding both a gluten free and vegan pizza. I was excited to see that my local health food store was carrying this new brand. It did not disappoint!! It was soft, had the crispy crust, the sauce was perfect and the addition of basil made this pizza so yummy. By far the BEST GF/Vegan Pizza I’ve tasted. This will be my go-to brand for now on. HERE is their website if you want to check them out! 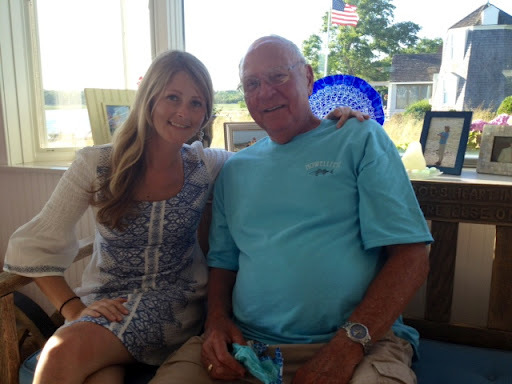 Hope you all had a wonderful 4th of July yesterday! 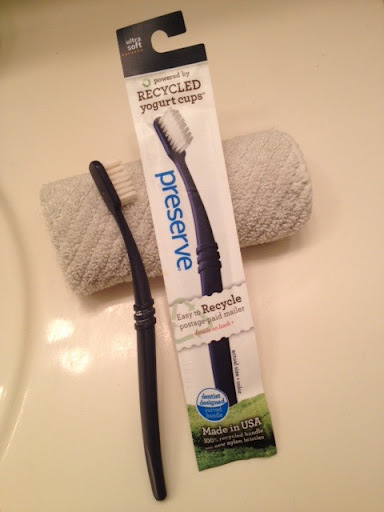 I will be back soon with a post about my daily beauty routine…makeup, teeth-cleaning, shower accessories…etc.